Hi there! A couple of days ago we talked about poop and constipation. I know that trying to get enough fiber in your kid’s diet can be a little overwhelming. So today, we’re going to talk about some great snack ideas to get more of that beautiful fiber in your child’s diet. Fiber is the leftover parts of your food that CAN’T be digested. There are 2 types of fiber… soluble and insoluble. The soluble fiber can dissolve in water and turns into a gel. The insoluble fibers stays the same and comes out just as it goes in. For our purposes here, both are important. But I’m not going to go into all of the ways each are utilized. For those of you with burning questions on fiber, you can check out this site for all you could want to know about fiber. What Kinds of Foods Have Fiber? Luckily for us, there are loads of foods that have fiber in them. All fruits and vegetables have fiber in them, although some have more than others. For example, 1 cup of grapes has about 1.4 grams of fiber in it. One small kiwi has 3 grams. Vegetables tend to pack a punch with fiber, but again, some have more than others. For example, 1 cup of broccoli has 6 grams of fiber. 1 cup of asparagus tops at 3 grams. Often overlooked sources of fiber in our diet include nuts, seeds, and legumes. Beans are actually a wonderful source of fiber and many kids love them which makes our job much easier. 1/2 cup of lentils holds a whopping 7.8 grams of fiber. An ounce of raw almonds holds 3.6 grams of fiber. Whole grains also have fiber in them. Things like whole wheat and oatmeal can be great sources of fiber. Wild rice, brown rice, rye, barley, millet, and quinoa are all excellent fiber sources as well. What Kinds of Foods DO NOT Have Fiber? Although there are many options that contain great sources of fiber, many of the foods that we eat on a regular basis do not have a lot of fiber. Meats can be part of a healthy diet and provide protein and iron, but they do not contain fiber. Most “kids” cereals do not provide a lot of fiber. Cookies and crackers are often made with refined white flour and are not a good source of fiber. Pancakes, waffles, white rice, white breads, donuts, muffins, and pastas also are not good sources of fiber… Basically “all the good stuff” as my kiddos tell me. Try to aim for about 5-6 grams of fiber per main meal and split the difference between the snacks. If you focus on the main goal it can be a bit overwhelming. Try to add a fruit or veggie (or both!) to each meal or snack, it will really add up over the day. Also, don’t forget that nuts and seeds also have fiber.. So adding a scoop of nut butter for your kids to dip their fruit in will really bump up their fiber content. 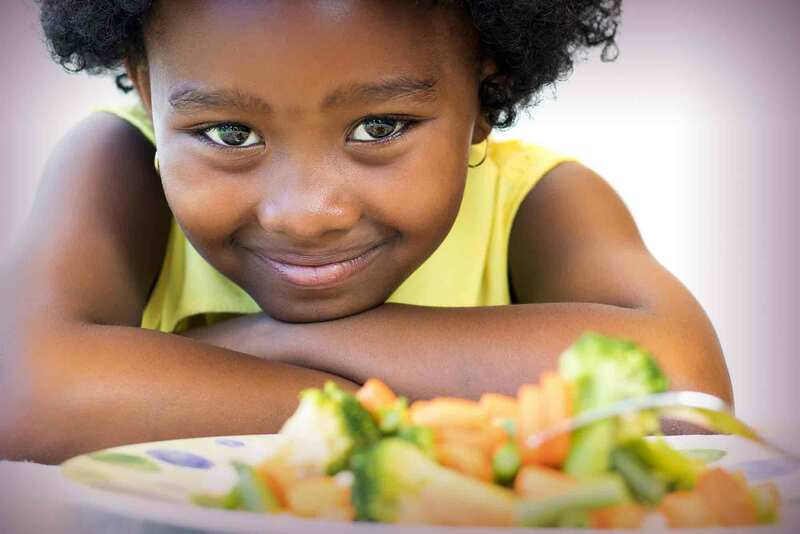 There are lots of great websites that are geared towards kids that discuss healthy diet. The choose my plate site is wonderful and has lots of activities and information. You can find it here. Below are just a few examples of food combos that taste great and give a hidden fiber boost. If you’re a baker, consider switching to whole wheat white flour for an added fiber boost. Oatmeal is a great breakfast that has a good source of fiber. My kids particularly love the Maple Brown sugar “weight control” option. A packet of this with an apple sliced on the side will give plenty of calories and about 8 grams of fiber total for the meal. Consider switching up your grains. Many of us enjoy white rice or pasta with our meals. You can try switching to a brown or wild rice or a pasta which is enriched with whole grains or fiber. If your kids are not buying the change, you can also cut down on the number of times you serve the white rice or pasta and make substitutions on the other days. Try switching out your starches with beans. Lentils and black beans make great side dishes and are easy to prepare and eat, even for your littlest family members. Try for 2 veggies per meal. Have your kids pick out something new to try to consider having them help prepare the meal. There are some great child friendly knives available so that you don’t have to worry about fingers coming off in the preparation process. Many kids like the little single serve gummies for a quick an easy snack. They are not high in calories and many claim that they are made with fruits and vegetable. However they are all sugar and no fiber and really have no nutritional benefit. If your kids are fans of chewy fruit snacks, then try out the new Pressed by Kind bars. The dark chocolate strawberry and dark chocolate banana bars each have 6 grams of fiber and are made from actual fruit with no added sugar. They also have apple chia, strawberry chia, cherry, pineapple mango and others that have about 4 grams of fiber. In general, try to get a “Rainbow” of foods into you and your child’s diet. Try new things and keep trying. Remember that sometimes even we adults may have to try new things MANY times before deciding we like them. Stay persistent and keep an open mind.